Kenny and I have been riding motorcycles together for about 7 years now. On the surface we often move in unison. To the observer we seem to ride with the same style, same pace, and the same lines. On more than one occasion it has been called a dance. This dance that we do together is something that I have never experienced with another rider at this depth. I can honestly say that I love to ride with Kenny. 99% of the time it’s a beautiful thing. By the nature of your relationship, there is a focus that your mate gets that a friend doesn’t. What people don’t often consider is that there is an unspoken downside to riding with a loved one. Worry. Even when you are confident that your partner will do everything in their power to keep themselves safe, it’s the things that are outside of their realm of control that can really eat away at you. I confess. I have become a major worry wart after watching the accident that claimed the lives of Michael and Cyndi last September. I don’t think I will ever be the same. While I’ve learned to cope with what I saw, as a human being I don’t believe I will ever really forget. It has left a scar on my heart and mind. As a result, when I watch Kenny riding I feel this overwhelming need to protect him; to try to keep him safe. As if I could. While in Kentucky this past spring on a day ride I was so wound up about it, I had to drop back to keep him out of my sight. I couldn’t concentrate on my own ride. I was too busy “checking” everything he was doing in front of me. I was praying a car didn’t pull out, wishing with all my might that the tires would stick to the road, mentally sweeping gravel out of the turns. It was exhausting and straight-up unhealthy. How about you – Do you ride with your partner? Is it wonderful, terrible or maybe a little of both? I know Greg and I enjoyed having your company at the other end of the line you drop back whenever you please. After I lost my husband last year, it was hard to ride again. It felt so funny. He always rode behind me and I never did think that much about it. After he was gone, it felt like I had forgotten how to ride. I always knew he was back there and not being able to see him in the rear view really freaked me out. I’m learning to get back out on my own, but I’m having a hard time riding alone. Guess it’s just gonna take practice. I think you’re right about the practice. All you can do is keep trying to go on, keep going forward with him in your heart over the miles. I am exactly the same. I sometimes worry too much, want the partner safe, but at the same time enjoy the riding time spent together with the spouse. So cool you ride with your dude! Great stuff! I did miss this post, nonetheless, it touched a chord. My worry began when my wife was dirt riding when my kids were babies. She’d seen me ride and race for years, and was accustomed to riding motorcycles. I’d seen her ride a little XR100 when we were dating, in nothing but a halter-top, “Daisy Dukes” and flip-flops, yet still, she’d kick it sideways, slide to a stop and then spin donuts, all to the chagrin of her friends and family. Me, I thought: I need to marry this girl! Having babies changed things. Although Karen, my wife, was now completely geared-up, she was riding a bigger and faster bike and on a motocross with very fast riders. Parenthood had mellowed some of her wildness, but she’d still single jumps and bust a berm or two as she followed me on the track. Although I’d lap her in probably 4 or 5 laps, she was riding her pace and having fun. And something changed in me as well. This wild and fearless girl, was now the mother of my children and some over-protectiveness switch toggled within me. When I’d lap her, instead of passing, I began to lay in behind her just to make sure she was “ok.” She was, but having me behind her bothered her. She’d stop and ask “what are you doing?” When I’d tell her I was concerned, she’d laugh, blow me off and spin a roost in my face. But I remember the feeling of protectiveness, concern and worry, very well. Then, at ages 4 and 5, my boys began riding. Again, geared-up head to toe on their PW50’s, they learned to ride with mom or dad riding close behind. Never though, having that feeling of apprehension entirely go away. Skipping ahead several years, my boys were now riding at my level and beyond. And I think my biggest fear was realized when my middle son passed me as we skipped across the top of whoops at probably 70MPH. He then went on to triple a jump I would only double. Although I was very proud what a great riders my sons had become, I was also terrified riding with them or watching them. My god, what had I created? Finally, last year, I got to street ride with my boys. Again, more change. I could not ride my pace. I didn’t want to lead because I’m too fast and didn’t want them riding beyond their experience level, but riding sweep was terrifying as well. They rode all the right lines and have skills that exceed probably 90% of street riders, but what’s around that blind corner? Gravel? A cage on the wrong side of the road? I thought to myself, I simply cannot believe how much we throw caution to the wind when riding with friends — instead of family. In summary, I just cannot do it. Of course, I do not like seeing my friends hurt or killed, but the concern I have for them is just magnified 1000 times when riding with family. Glad you brought this post out again. Sorry to hear about your friends. That is heart breaking. I thought is was just me, but your words about watching Kenny ride are the same things I do. I like to follow my hubby so I can “keep an eye” out! It is a rare occasion when I take the lead. Do you still do that? Any pointers on how to handle all those thoughts?? It was truly devastating to witness for all of us who saw it and the aftermath. I am usually up front when we’re riding together. I’ve always been the “navigator” and the planner so our riding together just evolved that way. Aside from actually getting us where we’re going, I tend to move a bit slower than he does so it helps to keep speed down. I suppose there is some aspect to me being “in control” of the situation that appeals to me to. When Kenny is riding in front of me, it’s usually when we’re riding with other people. That usually means we’re moving faster than I would be out front. That’s when I just can’t look anymore. I am so used to riding on my own, so I don’t mind just dropping back and doing my own thing. I try to remember that there is NOTHING i can do to keep him or anyone else safe. I have to trust that he will do everything within his power to keep himself safe. I’ve just got to let him go and do his thing. Pointers – I’m afraid I have none. My wife got her endorsement back in ’95, and rode a zephyr 550 that year. I think my unexpected (and unspoken) reaction of worry, that I suddenly felt riding behind her, finally caused her to revert back to her pillion position, and to give up piloting her own motorcycle. Odd, because I always thought she was much more natural, a better pilot than me. She always found the right line, the right entry speed. And I know I relayed those sentiments verbally, while keeping my fears to myself. But she knew. Shame, as I know she thinks a lot about riding again, even though she’s also perfectly happy participating as a passenger. Now my 24 yr old daughter also rides, having taken the BRC, and the only reason I don’t have a coronary is she’s a state away and I’m not a daily witness. But again, I’m logically aware that she’s a careful, trained rider and proficient pilot. But she’s my daughter, so logic is insufficient. So yes, I understand other’s worry for my safety, as I’m now worried for theirs. 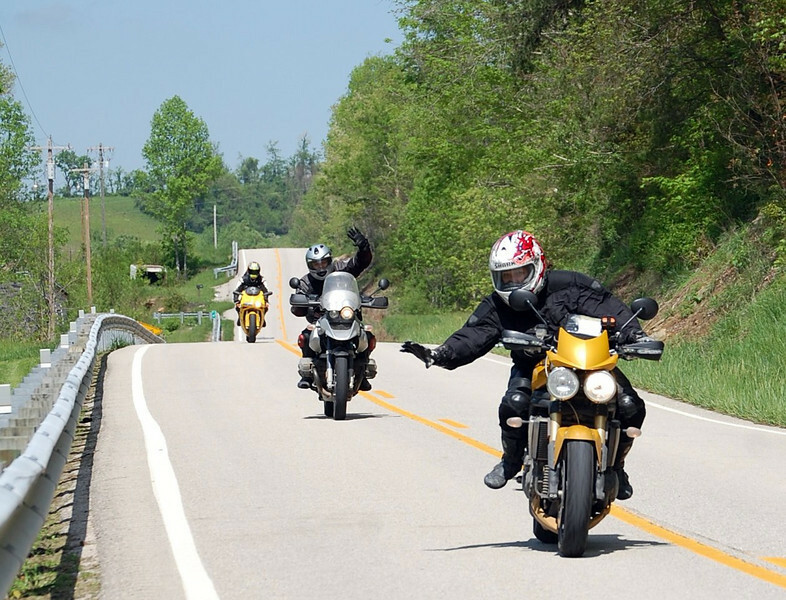 But I can’t deny anyone who’s ready the life that motorcycling gives me. I ride with my wife and at times it drives me totally insane with worry. The best thing I ever did was to install the SENA SMH5 intercoms in our Shoei Multitec helmets. Now I don’t worry as much.